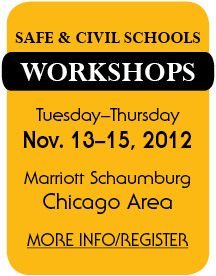 Safe & Civil Schools presents our Fall 2012 Professional Development Workshops with Dr. Randy Sprick, Dr. Anita Archer, and Dr. Bill Jenson. Designed for K-8 educators, this workshop series offers vital information to help you design proactive and positive classroom management plans, effective and efficient teaching strategies, and practical behavior management tools for your most challenging students. For more information, visit the Safe & Civil Schools website. Cheryl Saoud, a teacher from Jacksonville, Florida, talks about how she uses CHAMPS in her classroom on her blog post. Check it out! You are developing your school improvement plan. Imagine how valuable it would be if you could interview all of your staff, students, and parents to find out how they feel about safety, student-to-student respect, staff-to-student respect and fairness, consistency, clarity of expectations, amount and type of bullying, and more. Randy Sprick and Safe & Civil Schools consultants continue to provide presentations across the country. Some of these offer open registration. Registration may be limited and/or involve a fee. Contact information is provided for each on our website. Assuming you have determined that the student is truly choosing not to comply, the suggestion below may be useful. You're the teacher. Your students are supposed to be working independently, and you notice a student who is off-task. Ryan is sitting at his desk drawing on his hand. You do the logical thing—walk directly to the student and quietly say, "Ryan, you need to get to work." Instead of beginning his assignment, however, Ryan looks at you and says, "You can't make me!" "In Belton ISD we believe every student counts. Foundations has given us the framework to organize our thinking so we can teach students exactly what we expect. "Getting down and smelling the carpet (data analysis and improvement cycle) gives us the opportunity to make improvements that are meaningful to our teachers and students. We are impacting our community positively every day in Belton ISD." The staff at Belton Independent School District, in Belton, Texas, had a vision of where they wanted their schools to be, but reality didn't reflect that vision. Student behavior was changing, and not for the better. Buffalo Public Schools and BOCES 1 have collaborated on an article describing their Safe & Civil Schools implementation. The article, written by Theresa Schuta (Principal, South Park High), David Mauricio (Principal, Bennett High), and Sharon Comerford (Safe & Civil Schools Coordinator, BOCES 1), was published in the November 2012 issue of Principal Leadership. If you are a member of the National Association of Secondary School Principals, we invite you to login, read the article, and see how two inner-city high schools are making a difference.